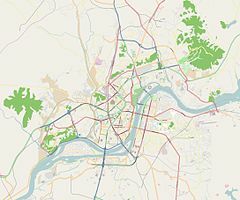 The Grand Monument on Mansu Hill (Chosŏn'gŭl: 만수대대기념비; Hanja: 萬壽臺大紀念碑) is a complex of monuments in Pyongyang, North Korea. There are 229 figures in all, commemorating the history of the revolutionary struggle of the Korean people, and especially their leaders. The central part of the monument consists of two 20-meter (66-foot) tall bronze statues of deceased supreme North Korean leaders Kim Il-sung and Kim Jong-il. The monument was originally dedicated in April 1972 in honor of Kim Il Sung's 60th birthday. At the time, the monument featured only Kim Il-sung. The statue was originally covered in gold leaf, but was later altered to bronze. Following Kim Jong-il's death in 2011, a similar statue of him was erected on the north side of Kim Il-sung. At the same time, Kim Il-sung's statue was altered to portray him at a later age and smiling. The statue of Kim Jong-il initially featured a long coat but it was promptly changed to his signature parka. South Korean sources have estimated the cost of the additional statue at $10 million, with North Korean workers working overseas being ordered to donate $150 each towards the monument. The monument as a function of time. Left: A 2010 photo of the original statue of Kim Il-sung. Top right: A 2012 photo of an updated statue of Kim Il-sung depicting him as an older statesman and an additional statue of Kim Jong-il. Bottom right: A 2014 photo showing Kim Jong-il with a new coat. Behind the central statues is a wall of the Korean Revolution Museum building, displaying a mosaic mural showing a scene from Mount Paektu, considered to be the sacred mountain of revolution. On either side of the statues, leading away from the building, are two monuments consisting of statues of different soldiers, workers, and farmers in their anti-Japanese revolutionary struggle and socialist revolution. The long line of human figures depicted on them are on average 5 meters tall. “ The group sculptures represent in a comprehensive way the immortal history of revolutionary struggle of the Korean people who have recorded only victory and glory under the wise leadership of the great Generalissimos. Not only on national holidays and commemoration days but on ordinary days it is crowded with people to present floral baskets and bouquets before the statues. Wedding couples are often seen there. The visiting foreigners, too, climb the hill and pay their high tribute to the great Generalissimos. All visitors to the site, both locals and foreigners, are expected to bow and leave flowers in order to show respect. Photos of the statues are permitted, but the photos must capture the statues in their entirety. ^ "Mansudae Grand Monument". Lonely Planet. Retrieved 2017-03-06. Every itinerary features this larger-than-life bronze statue of the Great Leader, to which a statue of Kim Jong-il in his trademark parka was added in 2012 following the Dear Leader’s death. The first statue was unveiled in 1972 to celebrate Kim Il-sung's 60th birthday. It was originally covered in gold leaf, but apparently at the objection of the Chinese, who were effectively funding the North Korean economy, this was later removed in favour of the scrubbed bronze on display today. ^ Willoughby, Robert (2014). North Korea: The Bradt Travel Guide (Third ed.). Chalfront: Bradt Travel Guides. p. 132. ISBN 978-1-84162-476-1. ^ Firn, Mike (December 5, 2012). "Kim Jong-il personality cult costs North Korea £62m". Daily Telegraph. ^ Vale, Paul (2012-04-13). "North Korea Statues: Kim Jong-Un Attends Ceremony In Pyongyang For Unveiling Of Family Monuments". The Huffington Post UK. AOL (UK) Limited. Retrieved 2017-03-06. North Korean leader Kim Jong-Un has attended a ceremony to unveil the country’s latest political monuments - a statue of his late father Kim Jong-il, which stands next to that of his grandfather, Kim il-Sung. The twin behemoths, created from bronze, form the centre-piece of the Mansudae Grand Monument in the capital, Pyongyang. ^ "Grand Monument on Mansu Hill". Explore DPRK. Archived from the original on 4 December 2017. Retrieved 3 December 2017. This page was last edited on 1 January 2019, at 21:52 (UTC).